On our trips home to the Island, the journey for Jordy and I is both clockwork and routine. After taking the 257 bus to Horseshoe Bay, we wander in the waterfront grass for a bit before lining up with the other walk-on passengers to board the ferry. Rather than settling into the pet area, Jordy and I make a beeline for the stairwell landing between car decks. While it’s an unofficial space that I share with other dog owners traveling the Georgia Strait, it’s warmer and dryer than the pet area. This past Friday, however, I was stopped by one of the BC Ferries employees en route to the stairwell. The employee asked me if the stairwell was, in fact, where I was headed to. Once I confirmed that I was, the employee nodded in the affirmative and simply responded with “good.” As it turns out, this employee wanted to say more than direct me where to go. I attempted to keep walking but was again stopped by this employee who whispered to me “you should e-mail BC Ferries and you should do it this week!” I questioned the reason behind this and was informed that the vessel I had boarded was to be taken out of service within a week or two for retro-fitting but that absolutely no plans were scheduled to amend the pet area in any manner. And further, the employee told me that senior staff on the ship were encouraging employees to pass this word along because even the ship’s staff were aware of how grossly inadequate the pet area of this and most other vessels truly are. I found this perplexing after being assured by the corporation last year that changes would be made sooner rather than later. A recent comment within the last month from a reader informed me that not a single thing had been done to the pet area on that vessel and that the deficiencies were still glaring. 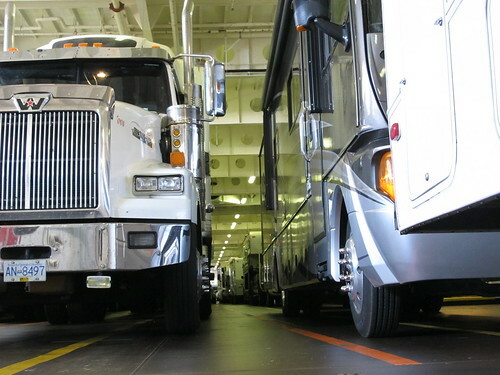 Following writing that particular piece, I was engaged in a series of back-and-forth e-mails and phone calls with someone at BC Ferries’ head office. Being that I wanted a record of our communication, I requested that all contact be through e-mail rather than the lengthy voicemails left on my cell phone. It would seem that my request was refused based on the fact that I heard nothing further from the corporation in any regard. What I was told, however, was that my requests for improvements to basic amenities would be taken under strong advisement and that the corporation recognized the need for pet area improvements. I was encouraged to “schedule travel plans from now on to coincide with the Coastal Renaissance” since the pet area on that particular vessel has much better standards. Unfortunately, the Coastal Renaissance is only used during the busy tourist months and one can assume that the vessel was designed to cater to tourists, not to the BC residents who rely on the ferry system for basic transport. Last year I received an anonymous e-mail from a BC Ferries employee who sent me this link; it would appear that the supposedly fuel efficient Super C class boats actually consume more fuel than their decades-old counterparts. At the end of the day, it is not my ultimate goal to drag BC Ferries’ reputation or name through the mud. The corporation is a legacy of this Province and one of the most beautiful ways by which to see coastal British Columbia. It is, however, a crucial part of how British Columbia functions and, as a pet owner, they’ve left me with a perpetual sour taste in my mouth. Would I pay a higher fare for a comfortable, adequate pet area? You betcha. Would other pet-toting passengers pay higher fares too? Undoubtedly. 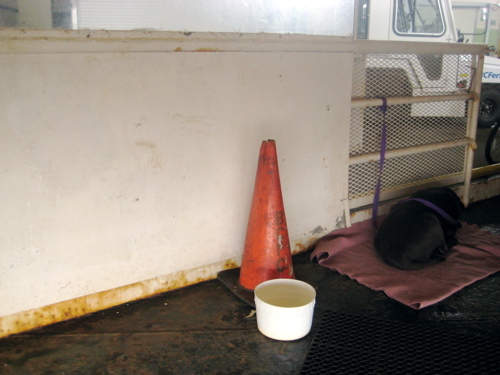 Next time you’re on a ferry, ask a passenger traveling with a pet how they feel. The sentiments are unanimous. All you have to do is look at the photos above and ask yourself if those are conditions under which you’d be comfortable traveling, particularly in the upcoming chilly winter months. Pet owner, animal lover or not – they’re inadequate for anyone and everyone. And, 18 months later, BC Ferries is seemingly still unwilling to amend the issues. If you feel so inclined, I urge you to please take a moment and send direct feedback to BC Ferries and encourage the corporation to take this matter seriously. 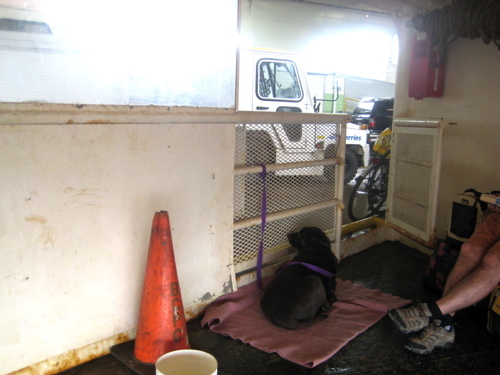 I take BC Ferries often and while I do not own a pet, I am familiar with the set-up on most BC Ferries. I sympathize with the plight of ferry passengers travelling with animals! An upgrade to most ferry pet areas is needed! If BC Ferries isn’t responding to your concerns, perhaps it is time to start a petition, Facebook page or lobby group? Not happy to hear that nothing has changed in a year and that they have no intention of addressing this horrendous situation. I second the suggestion for a petition. Fortunately as a cat owner, I can stay in the car and let my baby out of the carrier. But large dog owners do not have that option, especially if the pet needs to relieve themselves. For some pet owners, their animals are like their children. 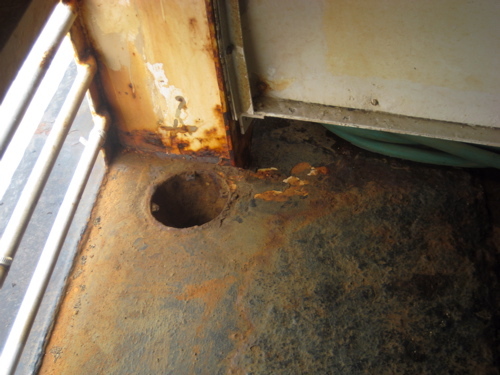 Would you let your child sit on that wet, rusty, unsanitary floor? The answer is undoubtedly, no. I agree with you – the situation is completely inadequate. Keira-Anne, you don’t have to worry about dragging BC Ferries’ reputation or name through the mud – they do that quite well enough themselves by their actions – or should I say lack of actions. I am still hopeful that one day not only will BC Ferries make the pet area safe and comfortable for all dogs, but that they will catch up with the times and realise that if buses can allow small pets in carriers on their system, surely BC Ferries can allow small pets in carriers on the passenger decks? Am I right in assuming the pink blanket was provided by a pet owner and not the ferries?! I too have made this trip with my dog and it’s not a pleasant experience by any means. I am in favor of being able to walk around at least part of the upper decks for some fresh air for the dogs. Thanks for bringing this to the attention of the unknowing public. I will be sending off an email to BCF again as I have already done several times in the past.